With the snap of a bone Karou remembers her former life as a the chimera, Madrigal, and the forbidden love that condemned her people. Karou returns to Eretz only to discover that the chimeran city of Loramendi has been reduced to ashes, its citizens dead. Grieving and heart-sick, she joins forces with the surviving band of rebels even though that means working hand-in-claw with the White Wolf. Laini Taylor casts a spell with her novels, easily drawing readers into a world of angels and demons where the demons are sometimes heroes and the angels are sometimes monsters. Nothing is Eretz is black and white and the moral dilemmas facing Taylor's characters make them real in a way not often found in YA Literature. Taylor's writing is sensual, hypnotic and original while her characters are wonderfully flawed. Karou is a passionate female lead who's strength comes from her deep and abiding love of the people around her, while Akiva is a warrior seeking redemption for his bloody past. Secondary characters are just as complex as main characters and their existence is integral to the story, providing the reader with interesting alternative perspectives. This is a dense, rich text dealing with issues of love, hate, redemption and morality. 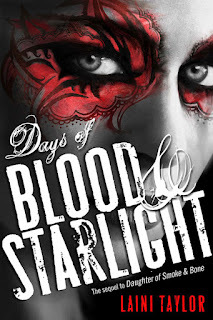 These issues make this Days of Blood and Starlight a perfect choice for classroom or book club discussion. Somehow, Taylor manages to keep a sprinting pace throughout the book, so be prepared to try and read this 500+ page epic in one sitting. Fair warning, this is only the second installment in a planned trilogy, so be prepared to finish Days of Blood and Starlight wanting more. WARNING: Read Daughter of Smoke and Bone before starting this novel!